At Feng Chia University (FCU), there is a program called “Bachelor of International Business Administration (BIBA).” This is a program where students who pass a certain standard of English take professional business courses all taught in English. By taking BIBA classes, students can gain professional knowledge and improve their English at the same time. The BIBA program also hosts a lot of activities to enrich students’ school life, like BIBA Summer Camp and studying abroad trips. 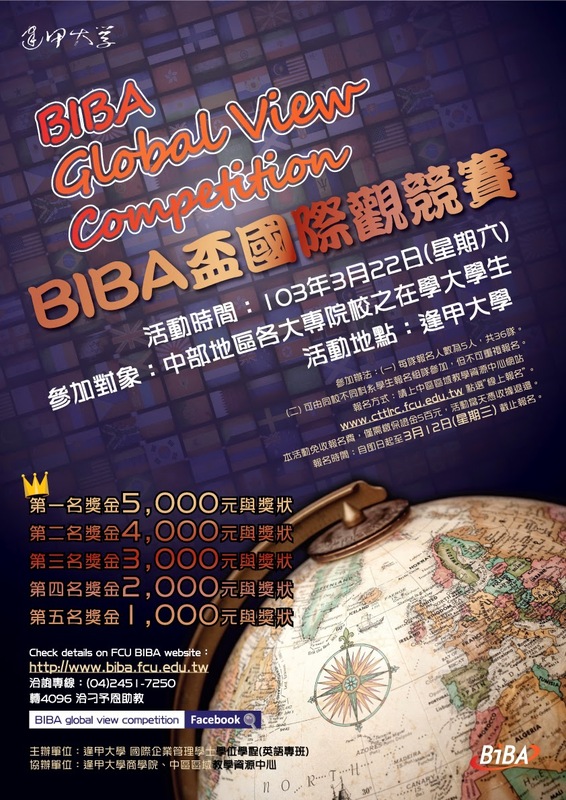 In March of this year, BIBA held a contest called "BIBA Global View Competition." My friend, Jacob, participated in the contest. He told me that it was very interesting, so I decided to interview him to learn more about the contest. Amy: Can you tell me what BIBA Global View Competition is? Jacob: It is a competition to encourage college students to enhance not only their global perspective but also improve their colloquial English skills. This is the first time that BIBA has held the competition; luckily, I had the opportunity to participate before graduating. It is possible that the BIBA Global View Competition will be held every year now, but I think that depends on the BIBA program’s financial situation. A: What are the rules of the competition? 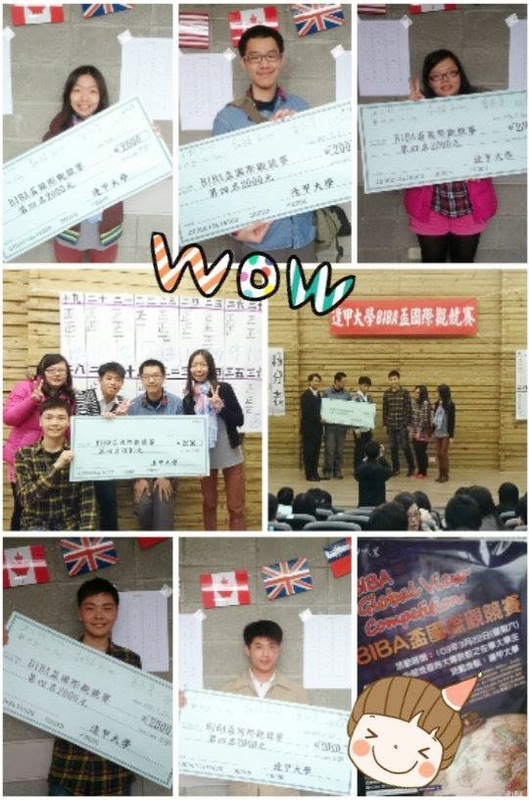 J: Five students form a team, and a total of 36 teams from different universities in Taichung city participated. The competition consisted of 20 multiple choice questions, and each question was worth one point. The rules were very simple—the team who answered the question correctly gets one point; so, the more points you get, the better chance you will stand to win the prize. Also, if there is a tie, there will be a tie breaker to determine the winner. In the tie-breaker, the first team to answer the additional question correctly will win. If there are more than two teams tied, the other teams continue to compete on other questions until all ties are broken and all prizes awarded. Finally, and most importantly, all participants have to speak only English during the whole competition. A: Why did you want to join the contest? J: There are several reasons why I wanted to join the competition. My main purpose was to make my résumé look better. Another reason was to create remarkable memories of my student life. Still another was my personal interest. Last but not least, as a senior this year, this may be the last opportunity to join an English contest at FCU. A: How did you prepare for the contest? J: Frankly speaking, we took part in the competition just for fun, so we didn’t prepare for it earnestly. Just two hours before the competition, my friend, Yen, and I simply browsed the Internet to check out recent domestic and foreign current events. Since we had one minute to discuss the answer after each question came out, we were not very nervous. A: What were your reflections during the contest? J: This was my first team competition; everything was really novel and exciting. After the first place was announced, the other four groups, including us, got the same scores, so we had to have a tiebreaker. When it came down to the battle for fourth place, we and another team were tied. Although the other team raised their hands faster, they answered the question in Chinese, so they failed to answer the question correctly. Then we had our chance. One of my partners tried to answer the question in English. Although his accent was not very good, his answer was accepted. His attempt won us fourth place! A: Do you have any recommendations for students who want to give it a try? J: Simply keep up with current events that happened shortly before the competition. Also, each person in your group might have different background knowledge, so the strategy of eliminating incorrect answers might be a good way to get the right answers. Above all, we should remember that as global citizens, it is our responsibility to learn more about the rest of the world and to constantly sharpen our English skills. That way, we will be able to talk to people from other countries and also have something interesting to say! After interviewing Jacob, I thought the contest was really interesting and exciting. If you want to improve your English skills and also like current events, don't miss the BIBA Global View Competition next year!